The LS keyless door lock is a perfect balance of security, benefits, and value. With features like auto lock, remote codes, and scheduled access, the perfect lock for you and your guests. The Lock allows you to take more control of your property than you have ever had. No keys, no cards, no lockouts. 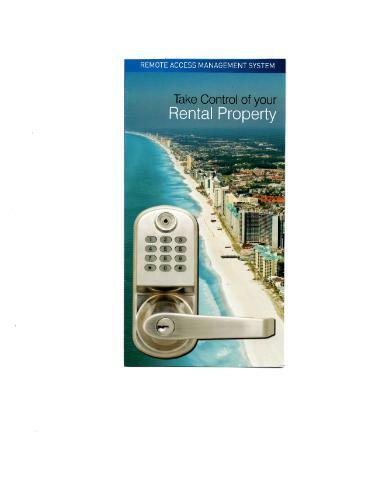 The Lock allows you to grant access to your rental property remotely, even if you are in another state. The lock can also provide selective access to not only your guests, but also maintenance, housekeepers, and contractors. Whether you are a management company or an individual owner that has a vacation rental you can rest assured that only authorized individuals gain access, and only when you want them in. Here is how Lock DOES NOT work. The lock never has to be connected directly to a computer nor do you have to connect the lock to the internet. Inside the Lock is a computer chip that runs a complex algorithm. This algorithm is able to compute what the code should be during any given time period. One way to think of it is that the lock is pre-loaded with codes. For example, if you wanted to give your guest access to your property from Friday at 2:00pm to Sunday at 12:00pm, your lock would already know . · Remote code generation – unlimited codes over the year. · Set times for lock to Auto Lock/Unlock daily (must be the same for all 7 days of the week). · Issue one-time use codes for contractors, cleaners, etc.